If you’d like to know more about the history of the–in my opinion–most beautiful castle of Scotland, you have come to the right place. Tantallon Castle is located in East-Lothian near North Berwick, just half an hour from Edinburgh if you take the train. For more tourist information, take a look here! 1346 William Douglas returned from France to Scotland to claim his inheritance after the battle of Neville’s Cross. 1353 By murdering his godfather William ‘Knight of Liddesdale’ in the Ettrick Forest, William became the undisputed head of the House of Douglas. 1357 William Douglas married Margaret, sister of Thomas, Earl of Mar. They had a son, James. Later, William took the widow of his brother-in-law, Margaret, Countess of Angus and Mar, as his mistress. They too had a son, George. 1358 William is created the first Earl of Douglas. The building of Tantallon Castle during this time was probably the result of this newly aquired wealth and status. 1384 William, Earl of Douglas, died. 1388 His heir James dies at the Battle of Otterburn. 1389 Margaret, Countess of Angus, resigned her Earldom in favour of her son George. Thus George became the first Douglas Earl of Angus and Mar and lord of Tantallon Castle. In a way the Battle of Otterburn lead to the division into the two Houses of Douglas. The head to the main line was Archibald, illegimate son of James. This line became known as the ‘Black Douglases’, the Douglasses of Angus became the ‘Red Douglasses’. Now we skip some Scottish rulers. I don’t want to bore you. ca. 1400 The main ditch of Tantallon Castle is widened and a barbican gets built directly in front of the Mid Tower. 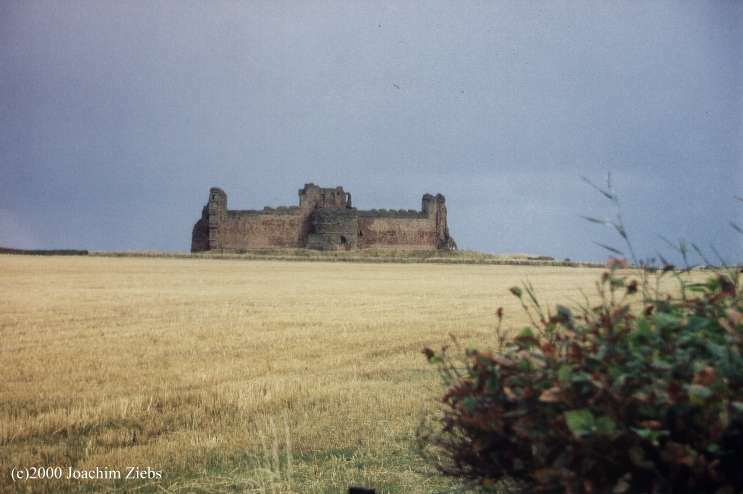 1491 Tantallon Castle is besieged by King James IV. 1528 The castle is besieged and taken by James V. To repair the devastations by this siege, a new Fore Tower is built up to the battlements. The East Tower is altered. Originally it consisted of five floors. Now the bottom three floors are reduced to two by inserting stone vaults. Thus the resistance against artillery bombardment was improved. To better attack the opponents, wide-mouthed gunholes were punched through the landward walls of the tower. The crenellated parapets on the main curtain wall were added after this year, too. 1544 English forces occupy the castle. 1651 Tantallon Castle is besieged and taken by Cromwell’s army. This information was taken from: Tabraham, Chris and Doreen Grove: Tantallon Castle, Scotland 1994.